2017 NEWS: Three Charles Dockum Mobilcolor films have been released on CVM's DVD, Visual Music 1947-1986 from CVM Archive. Full title list and details here. From MOBILCOLOR, a Dockum Research Laboratory brochure: "About the Inventor"
Charles Dockum was born in Corsicana, Texas, in 1904. He obtained a degree in electrical engineering at Texas A & M in 1926. Immediately thereafter began his intense interest in art, particularly in composition employing the functional use of form and color as conceived in the contemporary movement in painting and architecture. In 1935 he began the first experiments toward the development of Light Projection (MOBILCOLOR) as a fine art, combining a knowledge of music and the graphic arts with his previous training in electrical and illumination engineering. Several years later Color Concerts were given at Cal Tech and the Pasadena Playhouse. Solomon R. Guggenheim recognized the importance of this work in 1942 and furnished generous funding for the following ten years. Mr. Guggenheim planned to establish an Institute of Light with the Dockum MOBILCOLOR Instrument at its center. His aims were, first, to present Color Concerts, and second, to furnish training for students and artists in composing with colored light. Due to the death of Mr. Guggenheim and the loss of his funding, MOBILCOLOR was dormant until 1960, when the artist-inventor again started development of his own projection instrument in his studio at the Dockum Research Laboratory in Altadena, California. Beginning in 1971, Color Concerts were given at Cal State College, Hayward, and at Ramo Auditorium at Cal Tech, while continuous private showing were held at the studio. These included several series of Color Shows for surrounding colleges as well as single performances for many interested groups. Currently, MOBILCOLOR VI is being designed to utilize a mini-computer as part of its composing and performing systems. Charles Dockum died in June, 1977, but his new concept of visual art and the development of color symphonies is continually going forward. (published by the Dockum Research Lab shortly after Dockum's death). The Dockum system of Mobilcolor Projection differs from previous efforts in this field in its practical means of generating mobile form elements, and in the sensitive and accurate control of these mobile forms of light toward the production of a logical and moving thematic development, analogous to the manner in which musical themes are composed into structural forms known as sonatas, fugues, symphonies, etc. Without such control no system can hope to meet the requirements of a great Art and hold a wide, sustained interest among composers, critics and the public. 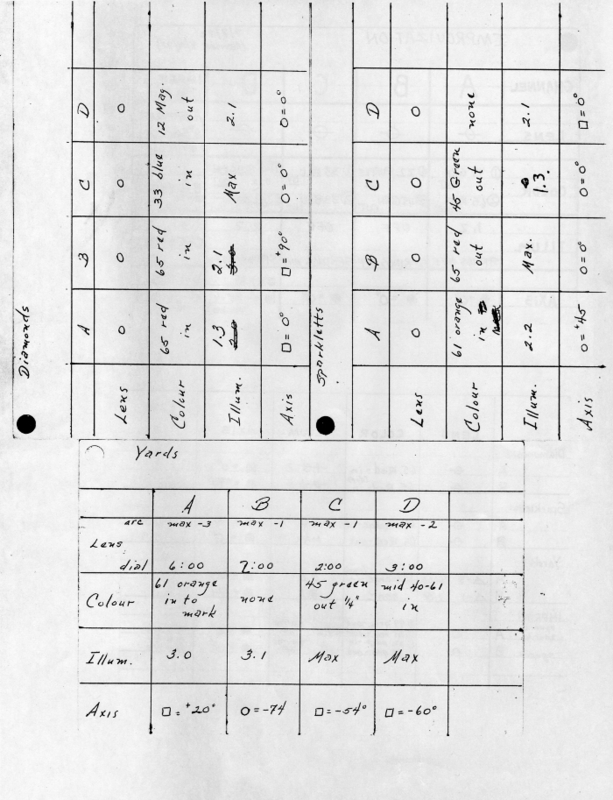 This system also provides a means of recording these visual compositions so that a permanent record remains of any composer's work, which can then be reproduced exactly as created. (Dockum Research Lab brochure). Program Notes. These were given to visitors attending Mobilcolor Concerts, providing brief descriptions of the compositions. (Courtesy Dockum Research Laboratory). GEOMETRICS: Sharply defined shapes develop rhythmically with emphasis on theme and variation. New colors are formed by the additive process of color mixing, unique to the medium of light. SPARKLETTS: Forms are made up of scintillating points of light. The use of varying light intensities causes the forms to come forth or recede in space, thus assuming a primary or secondary role in the composition. YARDS AND YARDS: A three-dimensional quality is produced by a special treatment of the objective lenses. IMPROVISATIONS: Manual and mechanical manipulations demonstrate the versatility and artistic possibilities of MOBILCOLOR, and how an artist would compose in colored light. Film Documentation An excerpt from Dockum's 1952 Mobilcolor Performance at the Guggenheim film, preserved by Center for Visual Music from the 16mm camera original (shot by Ted Nemeth), screened in the Visual Music exhibition at MOCA Los Angeles (February-May 2005) and The Hirshhorn Museum, Washington, D.C. (June to September, 2005). This film also screened at The Guggenheim Museum, New York, in 2005, accompanying their Hilla Rebay exhibition, in CVM's film series at The Guggenheim in 2010 accompanyiing the Kandinsky exhibition, at various other festivals internationally, and at The Hammer Museum, Los Angeles in 2009. This film and 2 others about Dockum's work travel in CVM's Essential Visual Music: Rare Classics film program, which has screened in the US and Australia. Other of Dockum's films have been screened by CVM at the International Film Festival Rotterdam, and LACMA, Los Angeles. 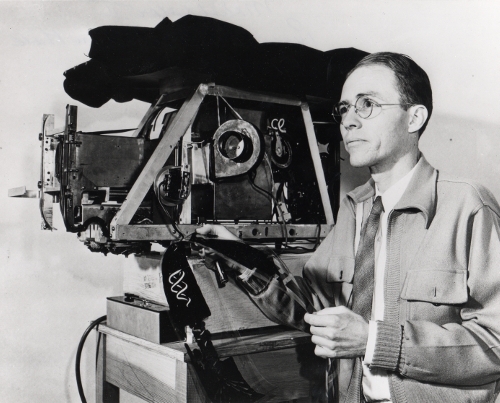 CVM is currently preserving Dockum's films. Several have been completed including a 1966 documentary by Dockum, and performance films from 1952, 1966, 1969 and 1970. Video on Demand: Stream Charles Dockum's Mobilcolor 1969 Performance film on our VOD channel on vimeo. The Projector makes use of two groups of celluloid films, 4-1/4" wide, the three films of each group being superimposed before a projection aperture. 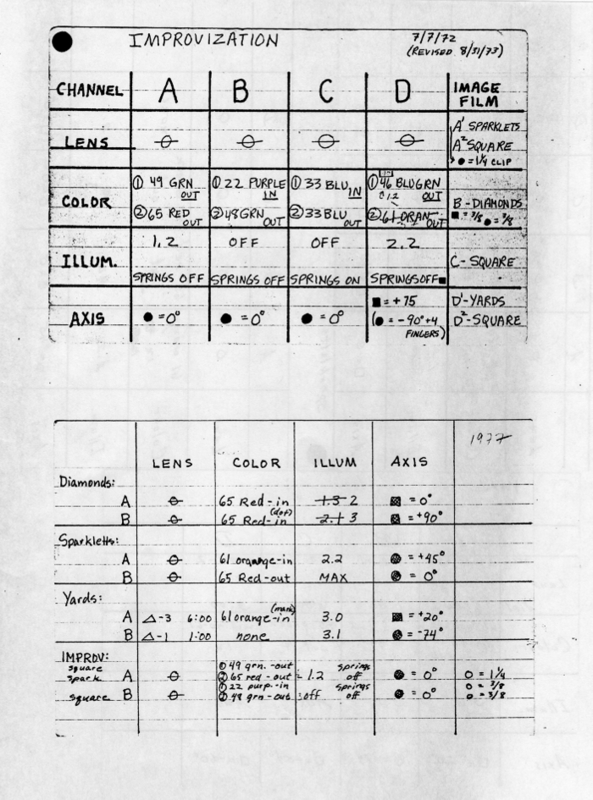 By means of a seventh, control film, the films in each aperture group can be made to move either up or down, change speed or pause before the aperture. By this means designs carried on the films are made to modify each other as desired and produce rhythmic movements and effects over a wide range. The control film also governs the intensity of illumination. Special lens arrangements give the projections a luminous, prismatic quality. The designs on the films are not drawn or painted on in the sense of painting a picture, as in animated cinematography. Rather the mathematical proportions are worked out which will give the desired results, and the films then opaqued to leave transparent "windows" which allow shafts or areas of light to pass through in guided movement. February 12, 1936. "An Evening of Modern Art." The Monday Club, Prescott, Arizona. Feb-March 1969 (7 performances). Arcadia Community Theatre - "Special 'Mobil-Color optical film effects created by Charles Dockum Research Labs." c. 1971. Cal Tech, Pasadena. Haller, Robert. "Charles Dockum" in First Light (New York: Anthology Film Archives). Ex. Cat. Levin, Golan. Painterly Interfaces for Audiovisual Performance. Thesis submitted to MIT, 2000. Keefer, Cindy. "Space Light Art" - Early Abstract Cinema and Multimedia, 1900-1959. in White Noise. Ernest Edmonds, Ed. Melbourne: Australian Centre for the Moving Image, 2005. Ex. Cat. -- "Visual Music and Film-As-An-Art Before 1950" in On the Edge of America: California Modernist Art, 1900-1950. Karlstrom, Paul J., Ed. Berkeley: University of California Press, 1996. -- Towards an Aesthetics of Visual Music in ASIFA Canada Bulletin, Dec 1986. --"Towards a Visual Music" in Cantrill's Filmnotes, 1985. 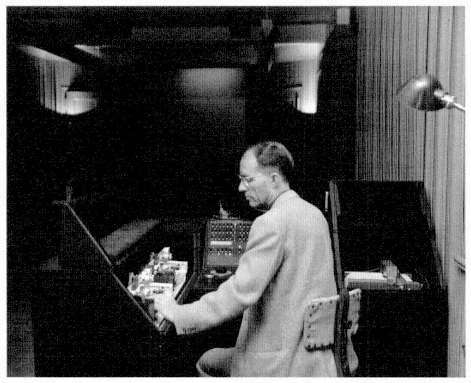 Excerpt: "...the special intensities and subtleties of live light cause others, like Charles Dockum (1904-1977) to devote over 40 years to the perfection of his fine Mobilcolor Projector, a classic example of the plight of the color organ. The Mobilcolor, a large, complex mechanism, requires two people to operate it for an elaborate composition - but the resultant spectacle is definitely worth it. The imagery can be hard-edged or amorphous, and can be programmed to move at specific speeds in smooth, definite patterns. The wide range of controlled light intensity, with several (overlapping) sources, offers a visual delicacy that can not be reproduced on film or video." Smith, Steven A., Greta J. Dockum, and Gretchen Evans Dockum. "Kinetic Art: The Mobilcolor Projectors of Charles R. Dockum (1904-1977). 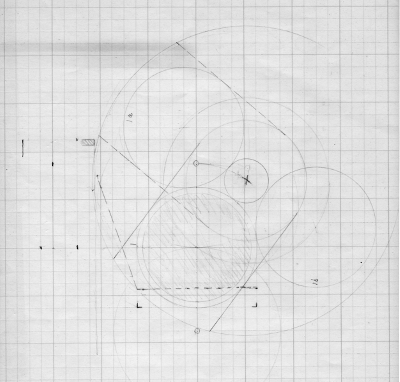 Leonardo 12 (1979), pp 144-50. Vail, Karole, Ed. The Museum of Non-Objective Painting. New York: Guggenheim Museum, 2009. Zuvela, Danni. The Musicality of the Moving Image. RealTime Arts, No. 85 (June-July 2008). Brisbane, Australia. You can also Support CVM by becoming a Member. Membership benefits include our members-only discussion list, and cool vintage Fischinger, Moritz, Whitney premiums: posters, cards, books, dvds. Learn more or join here. Photographs (c) Greta Dockum/Estate of Charles Dockum. All rights reserved.